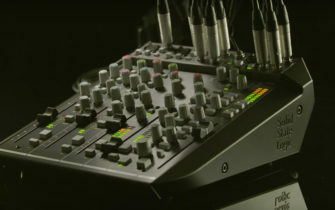 Roland has raised the bar with smart phone friendly mixing, with the release of the Go Mixer Pro. Bring the Studio with you, Roland’s new Go Mixer Pro gives you the ability to mix professional sounding audio anywhere you like. Feeling cooped up at home? Try bringing the session down to the park. The Go Mixer Pro makes recording high quality audio easy, and portable. The pocket sized piece is an update of last years Go Mixer and can connect nice audio sources including powered microphones, guitars and line-level gear. The unit sends a stereo digital audio output straight to your smartphone, ready to share. The Go Mixer Pro pairs perfectly with Roland’s smartphone apps 4XCAMERA and the newly launched Virtual Stage Camera, making it an essential bit of kit for podcasters and content creators. Dedicated inputs can capture three instruments such as keyboard, bass and guitar, making it easy to record demos, jam or rehearsals, on the go.